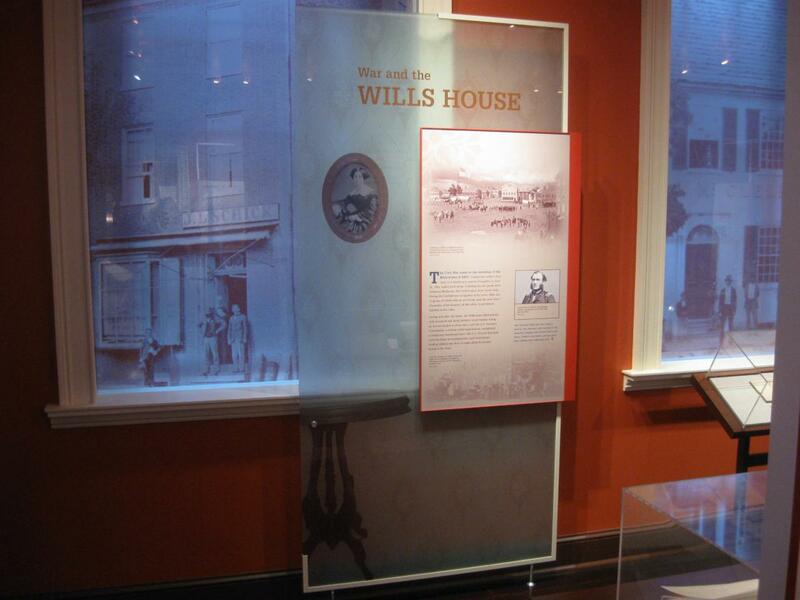 Today we are featuring the north wall of the Wills House. We will get to the diorama in our next post. Notice that there are three windows on the north wall (the left (west) window is barely visible above the center display. 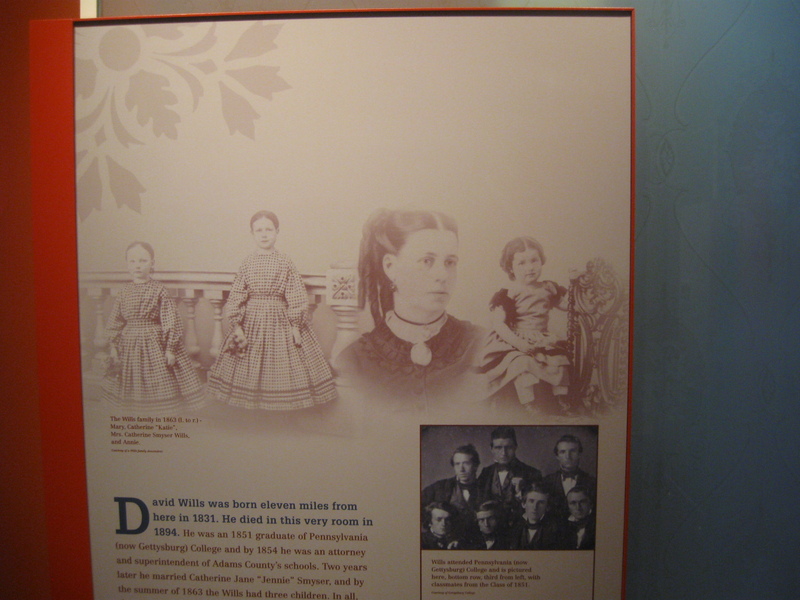 The windows are supposed to show one what the Wills Family would have seen out of them in the 1860s. 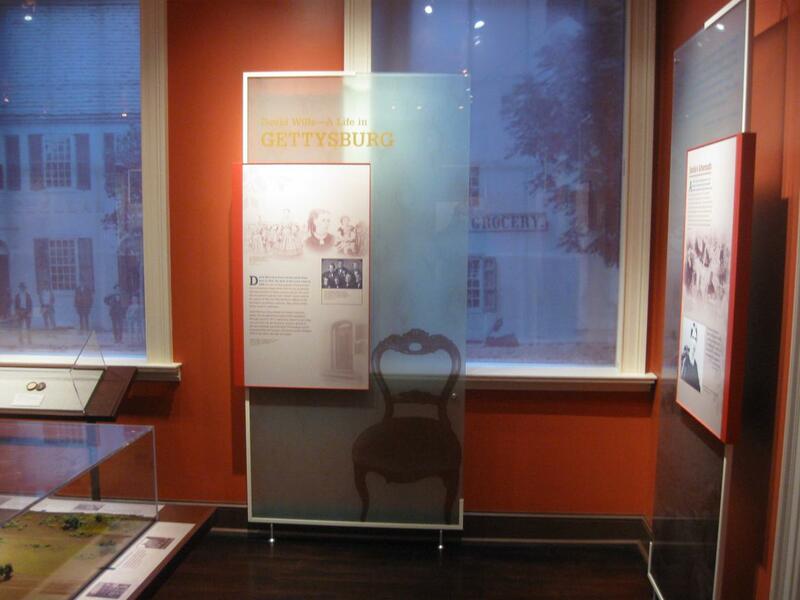 The center window shows the McClellan House (not the site of the Gettysburg Hotel) which would have been correct. Unfortunately, the other windows don’t match up to what could be seen by looking out of them, and is very misleading to some visitors. This view was taken facing north at approximately 4:15 PM on Wednesday, February 18, 2009. We continue our tour of the interior of the Wills House. In our previous posts of the interior of the Wills House, we showed the Entrance Ticketing area, and the Wills Parlor east wall. Today we are showing the north walls of the Wills Parlor. Why are we showing just a small portion of the parlor? Because (in case you can’t tell from our previous posts) we are very detailed oriented people who like to read every word when we visit museums and other historic sites. Remember that you can click on any of our images to see a larger picture. We will start by the east panel on the north wall. The east window on the north wall has a photograph of Boyer’s Grocery Store, which is on the northwest corner of the Diamond/Lincoln Square/Circle. The occupants of the Wills House could not have seen Boyer’s Grocery by looking out this window in 1863. They would have looked at Boyer’s Grocer from windows in the west wall. This view was taken facing north at approximately 4:15 PM on Wednesday, February 18, 2009. Here’s the top of the east exhibit on the north wall. 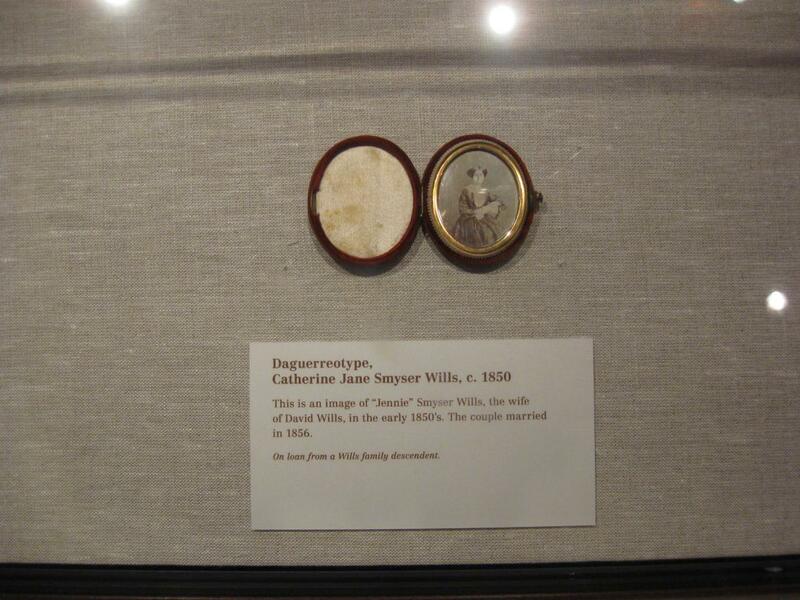 It shows photographs of the females in the Wills family. This view was taken facing north at approximately 4:15 PM on Wednesday, February 18, 2009. Here’s the bottom of the east exhibit on the north wall. It is a brief biographical sketch of of the life of David Wills. Remeber to click on the image if you want to read all of the words. This view was taken facing north at approximately 4:45 PM on Thursday, February 19, 2009. 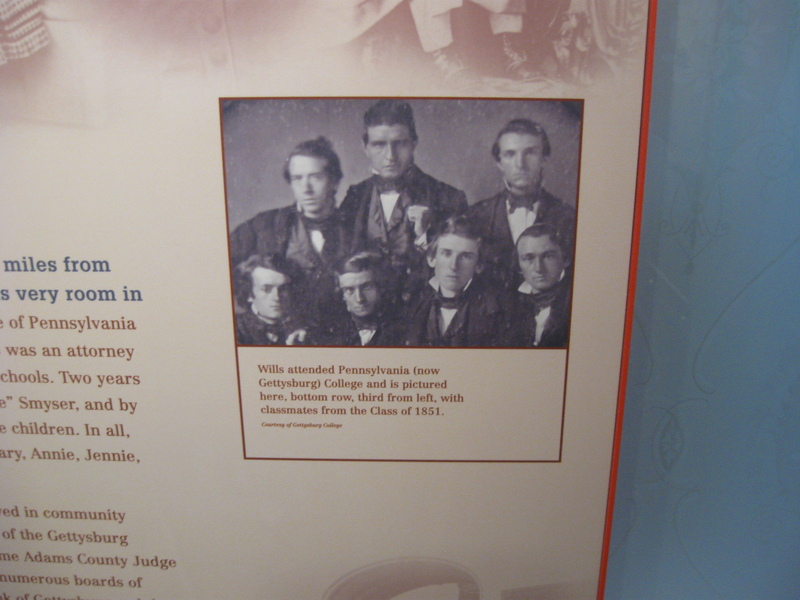 A detail from the east exhibit on the north wall is a photograph of Pennsylvania College’s class of 1851 which included David Wills. This view was taken facing north at approximately 4:15 PM on Wednesday, February 18, 2009. 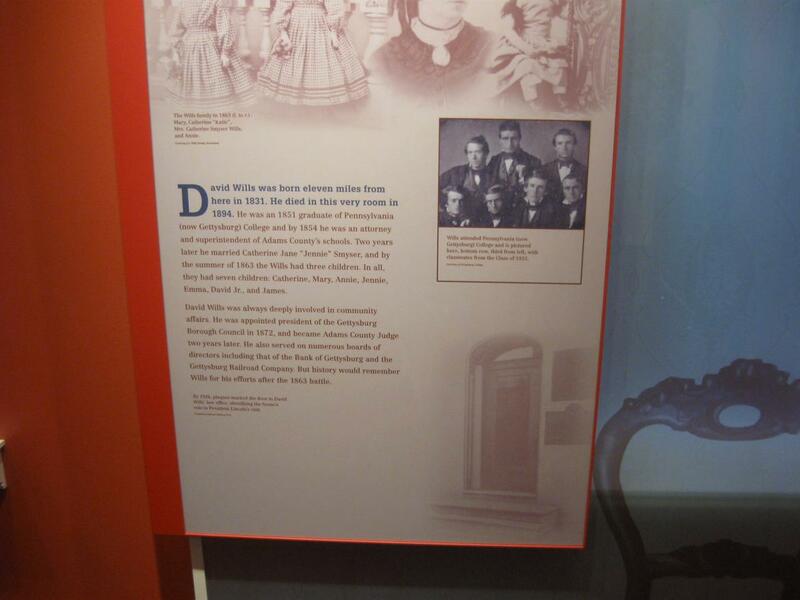 There is a small display underneath the center windown with the McClellan House photograph. It contains two objects. 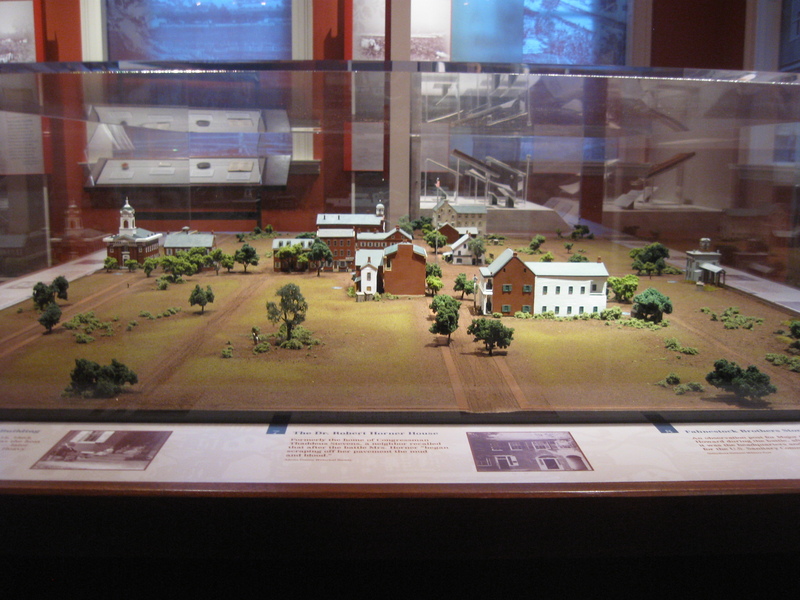 On the right (east) of the display case is a locket containing a daguerreotype of the future Mrs. David Wills… This view was taken facing north at approximately 4:15 PM on Wednesday, February 18, 2009. 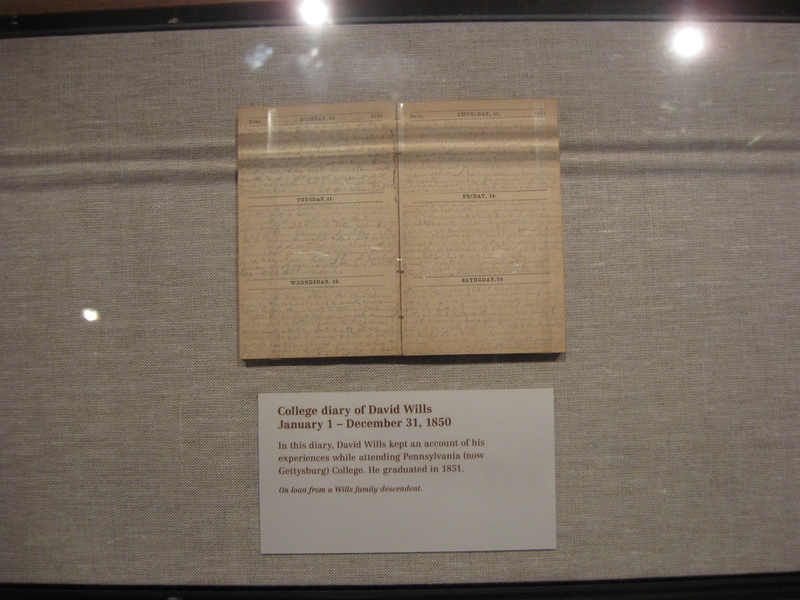 … and the left (west) of the display case is a diary kept by David Wills while a student at Pennsylvania College. This view was taken facing north at approximately 4:15 PM on Wednesday, February 18, 2009. The west window and display on the north wall. The window shows the Schick building on the southwest section of the Diamond/Lincoln Square/Circle. The occupants of this building would have seen it while looking out of the windows in the west wall, not this north wall. This view was taken facing northeast at approximately 4:15 PM on Wednesday, February 18, 2009. 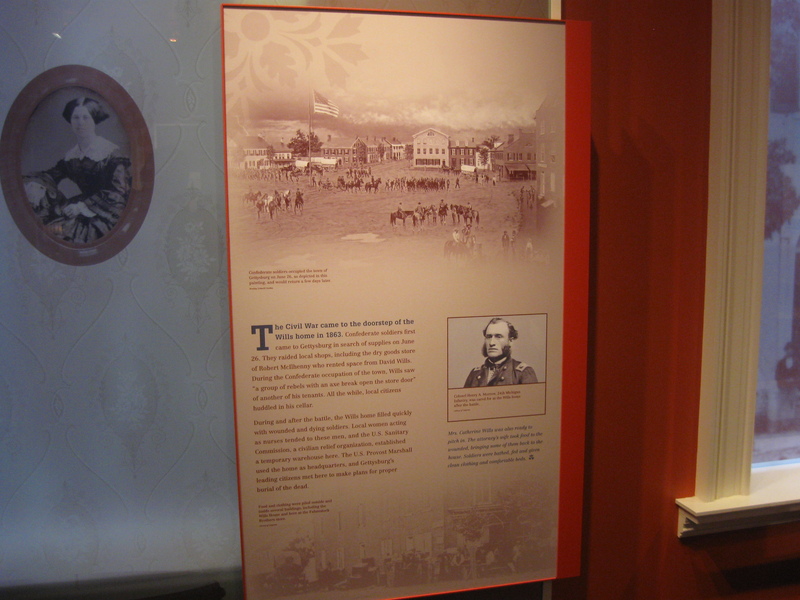 The western exhibit on the north wall, titled “War and the Wills House,” contains a photograph to the left of the primary exhibit. This view was taken facing northeast at approximately 4:15 PM on Wednesday, February 18, 2009. 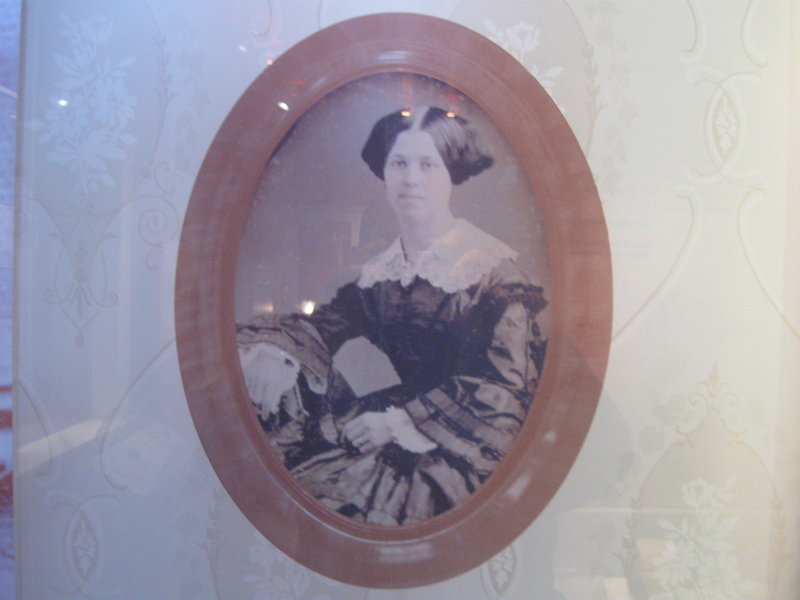 The photograph is of an older Catherine Smyser Wills (Mrs. David Wills). This view was taken facing north at approximately 4:15 PM on Wednesday, February 18, 2009. The top of the exhibit shows a black and white image from a painting “The Diamond” by Bradley Schmehl. 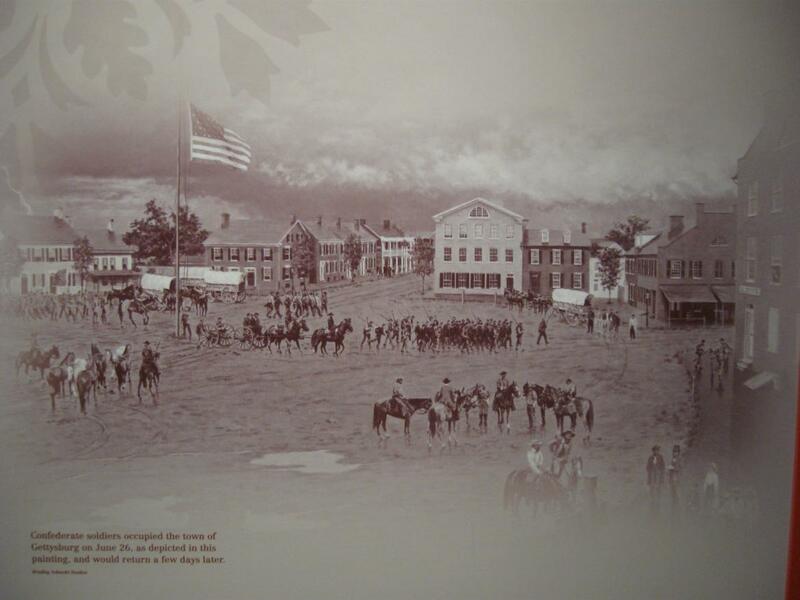 It depicts Jubal Early’s Confederates during their June 26, 1863 occupation of Gettysburg. The Wills House was painted gray, and only had shutters on the first floor. 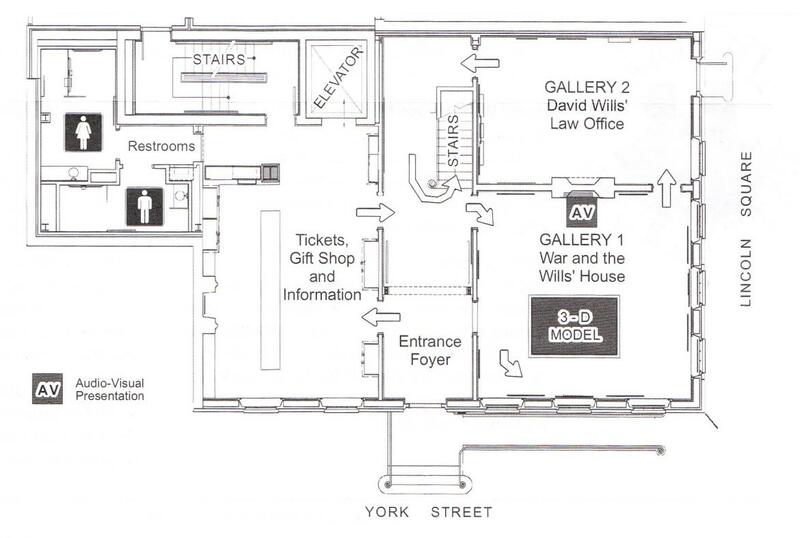 With the exception of the Schick building on the right of the painting and the Wills House, all of the other buildings on the Diamond/Lincoln Square/Circle have shutters on their upper floors. Maybe the Wills Family didn’t need shutters to help protect them from the weather which today blows from the west, directly at their house. The painting is facing east. This view was taken facing north at approximately 4:15 PM on Wednesday, February 18, 2009. 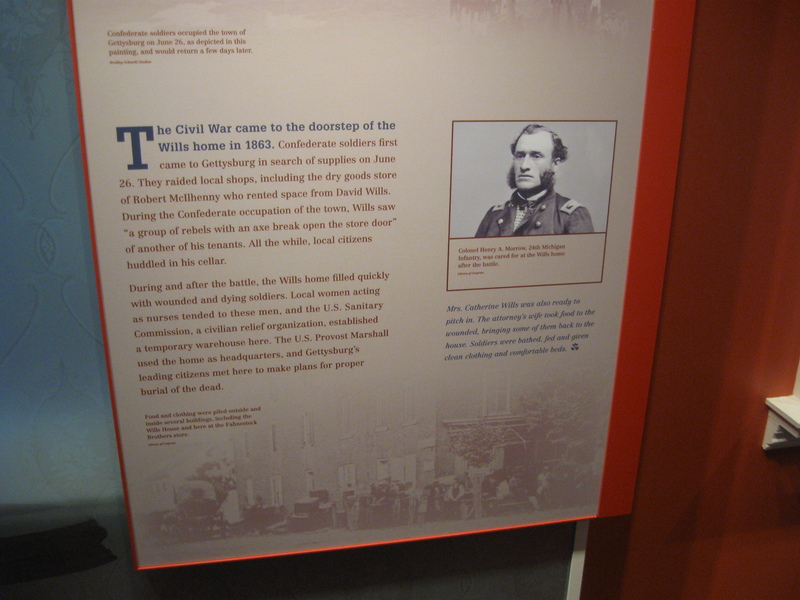 The bottom of the exhibit describes the Wills family’s actions during Confederate Major-General Jubal Early’s June 26, 1863 occupation of Gettysburg. This view was taken facing north at approximately 4:15 PM on Wednesday, February 18, 2009. 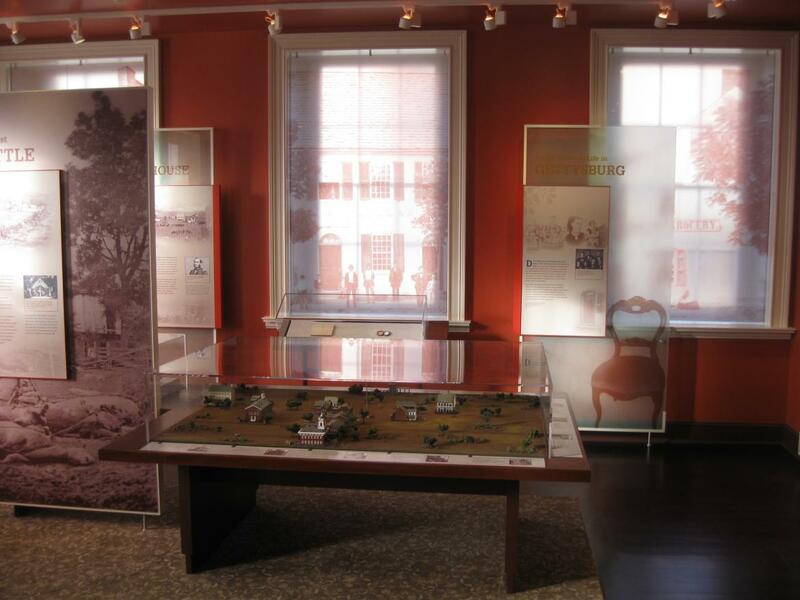 On our next visit to the Wills Parlor we will look over the controversial diorama. This view was taken facing west at approximately 4:15 PM on Wednesday, February 18, 2009.